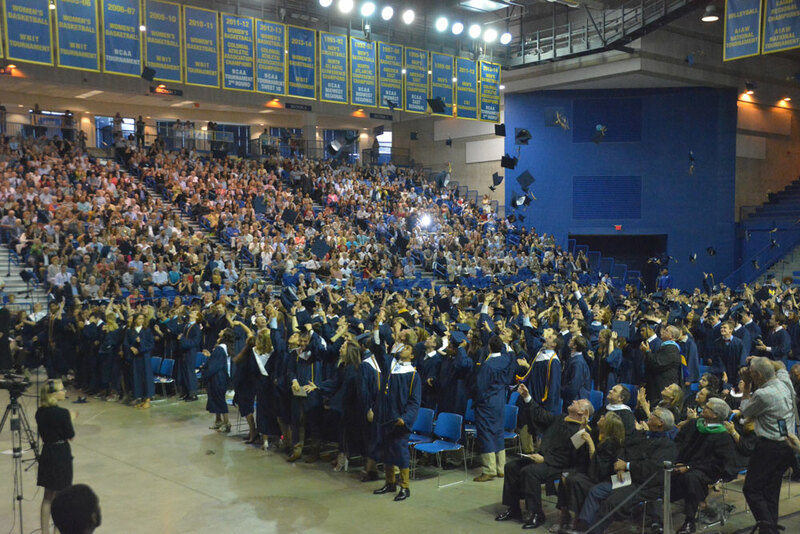 The Unionville High School Class of 2018 celebrates their graduation with the traditional tossing of hats in the air, Tuesday. NEWARK, Del. — Gratitude, remembrance and adapting to the change of perspective that comes with growing up were central themes by speakers during Tuesday’s 95th Commencement for Unionville High School, held at the Carpenter Center at the University of Delaware. UHS principal Jimmy Conley kicked off the speeches, noting that the simple art of saying “Thank you” seems to be growing into a lost art, and reminded graduates of its importance. 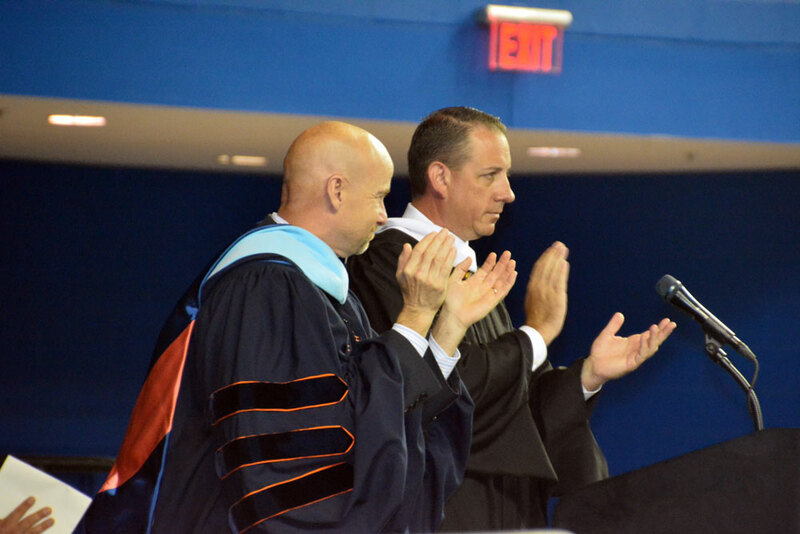 Unionville-Chadds Ford Superintendent of Schools John Sanville (left) and UHS principal Jimmy Conley applaud the Class of 2018. Conley noted that changes in recent years, sparked by the Internet and social media have changed how people interact with each other, and not always for the better. 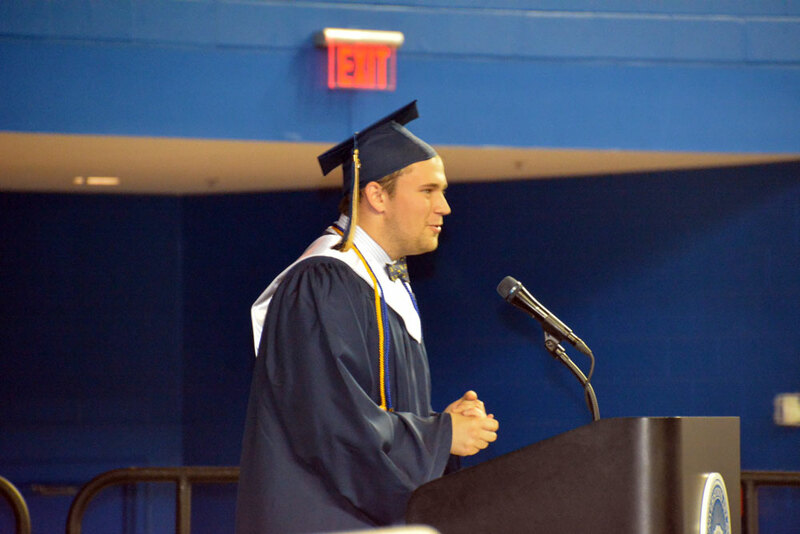 Senior Gavin Brezski speaks to his classmates during Tuesday’s Unionville High School graduation. Unionville-Chads Ford Superintendent of Schools John Sanville talked a bit about how much things have changed for the members of the class since they were elementary school students — something brought into clear focus when seniors went back to visit their elementary schools and a found a school that might have seemed much smaller than it was when they attended. Moving onto a wider world of college and careers, he noted, will be another new point of view. “You will leave here today with a new perspective,” he said. Graduating seniors Taylor Thornton, Ashley Mannello and Gavin Brezski all spokes of their years in the district, the friends they made and hopes for life after high school. World Languages teacher Veronique Lesko was honored as the UHS educator of the year.